Learn how you can start social selling today using the world’s leading social network for professionals, LinkedIn. Follow these 4 steps to embed social media into your B2B sales strategy and supply better leads to your pipeline. Our own studies have shown that B2B salespeople lag behind B2C in incorporating social media as part of their sales strategy. That comes as no surprise, considering that the need to appeal to a mass audience has always been most important for B2C companies. The two worlds used to be easily separated too, a business leader or department manager didn’t shop around for a printer for work in the same places they scoped out their last home printer purchase. They probably ‘had a guy’ or asked around their work community for recommendations to replace the office machine, while they bought their home ink-jet from Amazon based on a few 5-star reviews. Hey once you’re done here, you should check out our 5 best practises for social sellers, open up a new tab now! Nowadays however, the world lives on social media. Even in work and outside of it, we’re under the same community. That’s why as a B2B salesperson you need to start working like a B2C brand, but still employ your old school tactics to close the deal. The best place to do this, is without a doubt going to be on LinkedIn. With the help of this article you’ll learn the basics for getting started today, to create the foundations for future success in social selling. Yes, you are a brand. First impressions can count for a lot according to Entrepreneur who said, “It takes less than two-tenths of a second for an online visitor to form a first opinion of your brand.” – two-tenths of a second! With that in mind, you need to ensure that your LinkedIn profile truly represents the best version of you, as a salesperson and as a human being. There are three quick wins to rocking your LinkedIn profile and creating a great first impression. Login to LinkedIn now and visit somebody’s profile, what are the 3 key bits of information that you see first? These will be your quick wins, if done correctly. LinkedIn Headline – Don’t overlook this and don’t just enter your job title. This is such a smart move from LinkedIn because they recognised the value that a headline would provide here, considering that you have less than a second to make an impression. A good headline is made of parts; your job, who you help and how you do it. For example, my LinkedIn headline is currently ‘Leading experience in helping to amplify brands through Employee Advocacy’. Profile Picture – It’s amazing how many profile pictures you still see that are blurred or taken in a bar in Ibiza. That’s not to say your profile picture has to be boring, it should represent who you are but it has to be who you are ‘professionally’. Summary – Again, don’t overlook this. If somebody is genuinely interested in what you’re about then they’ll be tempted to click to see more. That’s what you want to achieve. Elaborate on your headline, outline what your goals and your professional passions are. These will show that you are human after all but also that you are focused on what you do. In the beginning, this task isn’t so much about creating a list that you’re going to use. It’s more to create a list of the sort of people you want to connect with. This is an important step that sits firmly in before you start inviting connections right away. Use LinkedIn’s new search filter options to specify the exact criteria you are looking for in a buyer persona. You may already have a list of companies in mind that you need to target, if so then use that. Your initial search might need to be broader however, for example a type of business or industry in your local area. You should also think about the benefits of connecting with people other than the head of a department or the CEO, at least right away. Yes, these people are probably the decision makers but in business it usually takes more than one person to push something through. Once you’ve connected with the top leads based on your criteria, monitor the success of their journey with you so that you can save your search or indeed iterate your criteria for next time. If you have access to LinkedIn Sales Navigator this process can be even more refined, so it’s a worthwhile investment. This next step will help you decide what sort of content you need to be sharing (or even creating) to boost your personal brand on LinkedIn. Do some deeper investigation into your LinkedIn connections to find clues as to how you can offer them value. Do they post often about a particular subject or ask specific questions? What sorts of articles do they already share from third parties? This step isn’t just about throwing them a like or a comment to make them feel good. This is about building a true understanding of your connections, you want to know them better than they know themselves! Once you have your findings, use it to create a positive impact on your company’s content. Don’t forget, you should also look for emotional cues too in their language. Mirroring is one of the oldest conversation hacks in the book and it works just as well online! This last step is where everything comes together and is where over time, you’ll start to make those big wins. Selling nowadays is more about building relationships and providing value outside of the transactional arena, which is why social selling is so powerful. Use your LinkedIn profile at least twice a day to establish yourself as an expert, not just in your products or services but in your role as a whole. Talk about your industry with passion, share articles from your company blog, join groups and take part in conversations. Ten years ago, people would probably have scoffed at you for putting so much effort into your online presence, but this is what is happening right now. 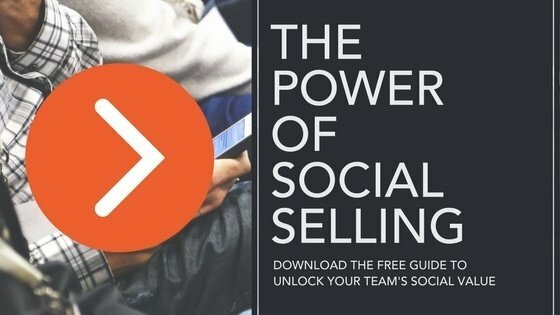 Your peers and competitors are doing this and they’re winning – 78% of social sellers outsell their peers.